Please see below for slides presented at MARUAH’s forum on the death penalty, on 28 May 2017. Join us for a ‘live’ streaming from Geneva on Wednesday, 27 January 2016. Streaming will start from 9.30pm. Doors open at 9.00pm. Information on this UPR session can be found at the link below. Take bus 410W or 52 from Bishan Bus Interchange and alight in front of Ai Tong Primary School. Midview City is just behind Ai Tong Primary School. 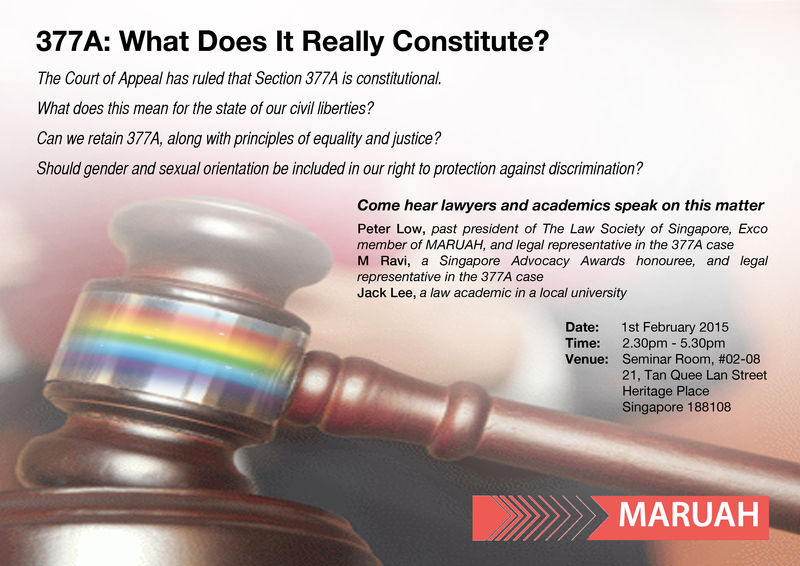 Please come and learn more about Singapore’s human rights track record. The UPR is a process where UN member states are reviewed on their human rights situation. Join our forum. Be part of this process. Raise your awareness. We are really sorry about the changes that we have been announcing for the forum – The Vote, the Elections and You: What Citizens Need for Free and Fair Elections. We were told that the original venue was no longer available for our use. Then we booked another venue where the owner got us mixed up with another group, and so we stepped back as the other organisation had booked the place first. So we have postponed the event. Section 377A: What Does It Really Constitute? The Court of Appeal has ruled that Section 377A is constitutional. What does this mean for the state of our civil liberties? Can we retain 377A, along with principles of equality and justice? Should gender and sexual orientation be included in our right to protection against discrimination? Come hear lawyers and academics speak on this matter. Register for this event at this link. Dr Jack Lee’s presentation can be found here. MARUAH’s statement on the issue can be found here. 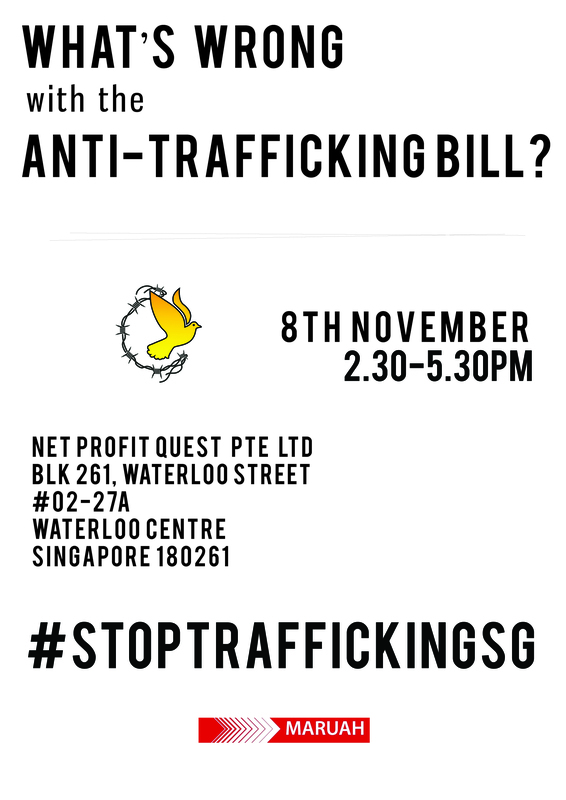 What’s wrong with the Anti-Trafficking Bill?